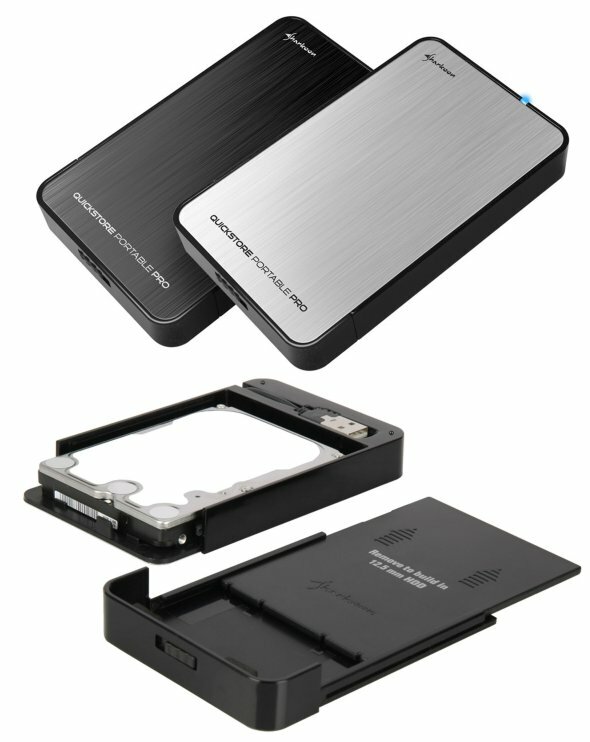 Sharkoon introduces the QuickStore Portable Pro, a new case that supports both 9.5mm and 12.5mm high hard disk drives. You can get it in black or silver, the USB 2.0 edition has a suggested retail price of 9.99EUR and the USB 3.0 should sell for around 16.99EUR. Sharkoon is expanding its line of external hard drive cases and presents the Pro version of its QuickStore Portable. Both models offer an elegant housing for 2.5 inch SATA hard drives and SSDs. The Pro version now allows more flexibility in the assembly height: Hard drives in both heights of 9.5mm and 12.5mm can be inserted. With help from the accompanying compensation plate, the internal height of the case is adjustable so that both hard drive formats sit securely and vibration free. Assembly is fast and completely tool free with a few simple steps: The housing frame easily unlocks and slides open. With the option of either a black or silver brushed metal cover, the Sharkoon QuickStore Portable Pro is also visually impressive. A blue LED illuminates during operation and data transfer. Through Windows a practical Backup function is available, which can be easily installed using the included software. Besides the color version, users can also select the external interface: Sharkoon offers the QuickStore Portable Pro with either USB2.0 or USB3.0 interfaces. The connector plug of the USB2.0 model folds out from the case frame. The QuickStore Portable Pro measures 134 x 82 x 18.5 mm (L x W x H) and weighs 80 grams. Shipping includes brief instructions plus a Tool CD with Backup software, detailed PDF instruction manual and depending on the model a USB2.0 Y-cable or a USB3.0 cable.